Nicholas Sansbury Smith just continues to get better and better. I started reading his Extinction Cycle series a few years ago and it has been of great enjoyment to see how much his writing has improved since then. 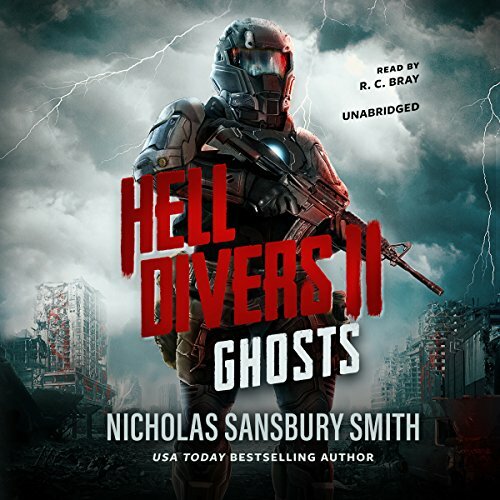 Keeping with the post-apocalyptic theme that is right in Smith’s wheelhouse, we have the follow-up to his breakout hit ‘Hell Divers’, which was an Audible Editor’s Pick of 2016 and an Audible Best of 2016 Science Fiction. Though no prior knowledge is needed to enjoy Ghosts, it is nice to have some context as to how exactly we got to this point. Set a decade after the events of Book 1, we are introduced to the new Hell Diver Raptor Team and its commander, Michael Everheart. When a distress beacon calls the divers to the surface, Michael leads his team from the safety of their home in the sky, into the throes of an electrical storm and the desolation that awaits them on the surface. What they do not expect is to uncover secrets that their fearless leader, Captain Jordan, has buried in order to keep his place of power. Meanwhile, the surface is even more of a danger zone as the creatures left behind from WW3 have begun mutating and pose more of a threat than ever before. They dive for humanity’s survival, but at what cost? While the characters are very much surface-level as far as depth, Smith does give the reader plenty to enjoy from his heroes/heroines, and even the antagonists. But what you really come for is the gunfights and monsters. The author has created many creatures over the years and they continue to evolve into some of the most disturbing and downright scary things you would ever want to come across. He also does a phenomenal job of world-building, starting with the airships which hold the last of humanity (or so we think) and ending with the devastation that is Earth. All in all, if you want a rip-roaring roller coaster ride from hell ride condensed into book form, look no further. Smith certainly knows his stuff and I cannot wait to see what awaits us in Deliverance (Hell Divers, #3), which comes out on May 15th. I also recommend listening to the audiobook, performed by the fantastic R.C. Bray (The Martian). He is one of the best in the business, as you can see from his plethora of awards.